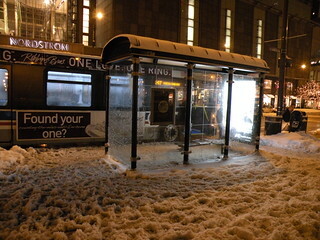 Several years ago JC Decaux won the contract the replace all the CTA bus shelters throughout the city. They maintain and clean them, change advertising signage, etc. But there are still a handful of old (circa 1960s?) bus shelters around, in seemingly random places. (2650 West Montrose; on California between Roscoe and Addison - to name just two in my neighborhood) I'm curious why these remain. Was it just lack of planning, or is there some other more interesting reason? Find out why some of these stands are still around, and why they'll probably continue to remain, decaying.